Stunning upscale townhouse located across the street from the base of of Mount Snow (GREENSPRINGS) 3 floors, 5 bedrooms, 4 baths. Spacious, comfortable, clean. If you want a cozy retreat for a big group -- this is it! Wi-Fi, cable, DVD, roaring fireplace. Dining area + eat in kitchen. Deck with mountain view, gas grill. Second large living room + 2 bedrooms on lower level / mountain view: very private. Clubhouse with indoor pool Jacuzzi and gym. King bed in Master bedroom, queen in second master, twin beds in remaining three bedrooms. Washer and Dryer. Fully equipped + linens. Terrific restaurants nearby. You'll get so relaxed you'll never want to leave! Mount snow has reputation for best snow making in the East -- last year skiing started in November and lasted well into April. Also has the only 8 seat 'bubblechair' -- fully covered so you stay warm on your ride up the mountain! Unbelievable groomed conditions! This house has special rates for holidays. I am open to price negotiation for smaller parties. 3.5 hour drive from Manhattan, lots to do year round. Summer is the best kept secret in Vermont, and this is the place to enjoy it! Free shuttle bus door to lift and back, every half hour all day. This house is in great shape and has been rented only on a few occasions. I am looking for renters who can be considerate of a great place to vacation! Max 10 people. Prefer adults and older kids. NOTE: THIS PROPERTY IS AVAILABLE FOR HOLIDAYS ONLY!!! Not recommended for large parties with young children. Damage deposit required + cleaning fee. Clean linens/towels provided. Beds made and house ready to use immediately. Staples not locked up--replace what you use policy. 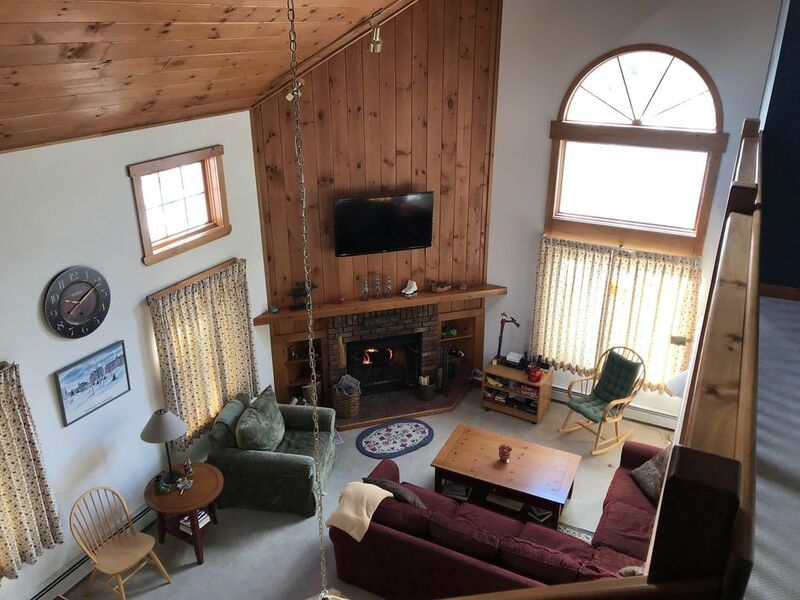 I just rented Mary Anne's Vermont vacation house over the New Year's holiday. The pictures really don't do it justice! It's extremely spacious, clean, and in close proximity to the mountain and to bars and restaurants. Mary Anne was so a great renter which made the process a lot easier. My party will definetly be returning, so I recommend you experience for yourself. Just wanted to tell you what a great time we had this weekend! Your house is awesome and we are anxious to figure out a time that we can go back. We trust that you'll find that we left the house in perfect order (the cleaning folks might wonder if anyone was even there). Thanks again...we had a blast! We would very much love to rent your place again. You can tell it is a home, not just a vacation spot. We are very sad to see our vacation end! Thanks again for everything! We had such an amazing time staying at Mary Anne's fabulous Vermont home. The home is very well decorated, comfortable, relaxing, and so spacious. You definitely can't beat the location, right near restaurants and walking distance to Mt. Snow, or the amenities. Everything about our stay was amazing right from the start. Mary Anne was a pleasure to work with and we will definitely be returning to her home if our travels take us to that area again in the future. This vacation home is truly a gem, and was even more impressive in person than what I was expecting from the pictures. I have owned this house since it was first built. The moment I saw it I fell in love with it. I was able to customize all the furnishings and wallpaper + finishing touches that make it very homey. I have never rented until recently when I began traveling more so now I rent only at select times. The house is in terrific shape and not your typical barebones rental. As a result I am very careful about who I rent to. Because I don't lock things up (I use it when not renting), it is not really child proof so not really suitable for small children. I also tend not to rent to very large groups (more than 9 or 10) to minimize the wear and tear. Everyone who visits falls in love with the place -- especially because the couch and furniture are sooo comfortable. I believe the couch is a place you should be able to sink into and want to stay! Just installed a large flatscreen TV with apple TV for living room. With 5 bedrooms and 4 baths there is no waiting for a shower. The deck has a view of Mount Snow and it is wonderful in both the summer and winter. Just writing this makes me want to go for a visit! :) I have been very happy with my renters so far as they seem to enjoy my home in Vermont as much as I do!!! I have skied at Mount Snow for the last 20 years and it is a place that is home to me. A very friendly mountain, it is challenging enough for good skiers and gentle enough for beginners. The area around west dover is quaint (especially the town of Wilmington, and there are a many really great restaurants. Good night life with music if you are not too tired from skiing:). Everything is taken care of for you including snowplowing, firewood etc. The clubhouse is beautiful with an indoor pool, sauna and large jacuzzi. A great feature is a shuttle service to the mountain every half hour so you don't have to hassle with parking -- door to door service! And it allows members of your party to leave when then want and not to have to wait for 'the car'. Thanks guys! Appreciate the feedback!! Great location owner was very helpful and responsive. Thanks Frank. Appreciate your taking the time to write this review! You are welcomed back any time. We feel our vacation was lovely. We thoroughly enjoyed our time, there was room for all. Great view of the mountain and the pond with the ice skaters. Plenty of seasoned wood to enjoy the fireplace. We would definitely come back if the owners will have us. 5 Star all the way. Wow! Thanks for putting a smile on my face Renee. I am so glad you had a great time! The home was so spacious - location could not have been better. Kitchen was fully equipped. Loved having a fully finished basement for the kids to hang out in. The owner was so accessible. Would stay here again in a heartbeat! Robyn and family were wonderful guests! Very respectful of property and very easy to communicate with. They are welcomed back any time!!! "Amazing New Years Eve Weekend"
What a great "Home"notice the word home.From the start we felt and took care of the home like it was ours.So comfy and warm.Every thing was in great working order and we had more than enough room.We were two couples and six young adults.Every one had a bed and a hot shower.AHHHHH the comforts of home.We could have went out for NYE but instead ordered from Joe's in town and were very happy we did.A side bar to all this my son got engaged on the top of the Mt Snow.There was a great celebration and again we felt like we were home.We definitely are coming back.This time we will use the hot tub and pool.It looked beautiful we just did not have the time.So every one do not even think about next NYE I'm booking now.Haha Thank you M.A.D. You really handled every thing with class and professionalism. Rob -- what a pleasure it was to have you and your family as renters!!! This is an amazing review and I'm so glad my house will be part of your good memories. Thanks for taking the time to write and I very much look forward to a return visit! Happy New Year Rob!